Beijing, formerly known as Peking, is the capital of the People’s Republic of China. Situated in the north, neighbor to Tianjin and Hebei provinces, Beijing is the largest city in China after Shanghai and one of the most populous cities in the world. A popular tourist destination, the city is has sixteen districts and over 3000 years of history. The Beijing Capital International Airport is 26 kilometres from downtown Beijing and is the largest airport in China. The airport has three terminals dealing with both domestic and international flights. Terminal 3 is a massive 244 acres and terminal 2 alone handles over 26 million passengers a year. There are four main railway stations in Beijing: Beijing Railway Station (for the north and east of the city), Beijing West Railway Station, Beijing South Railway Station and Beijing North Railway Station. Beijing West Railway Station is the largest railway terminal in Asia. Other stations include Beijing East and Fengtai Railway station. Furthermore, a high-speed railway system runs between Beijing and Tianjin and bullet trains connect Beijing with Shanghai, Wuhan, Shenyang, Changchun, Harbin and Qingdao. Nine expressways pass through Beijing including Badaling, Jingcheng, Jingtong, Jingha, Jingshen, Jingtai and Jingshi. However, there are plans for many more including connecting Beijing with Shanghai, Kunming and even Taipei. The Beijing subway system has 17 lines as well as an airport express line to Beijing Capital International Airport. The cost of the subway rose in December 2014, following the introduction of new lines. The system now calculates costs by determining the length of the journey. Beijing is considered the cultural capital of China. Consequently, the city is home to many of China’s most renowned sights including Tiananmen Square, the Forbidden City and the Summer Palace. Since Beijing is home to a total of 82 universities and colleges with 550,000 students and staff, investment in education is rife. In addition, Beijing is also home to China’s largest science and technology research bodies. Beijing’s Central Business District (CBD), located in Chaoyang District, covers 3.99 square kilometers and is home to more than 20,000 enterprises, 1,000 financial service providers and leading media organizations. Often referred to as Beijing’s Wall Street, the CBD was able to secure investments from many international companies with its good investment environment, convenient transportation and a high-speed telecommunications system. More than 150 Fortune 500 companies including Cisco, Hewlett-Packard and Samsung have established offices in the CBD. Office towers, hotels, first-class apartments and multiple service organizations involved in finance, IT and intermediary service industries make it the city’s biggest and most rapidly developing economic area. The CBD has developed four key business areas – the China World Trade Center Area, the Chaowai Area, the Lufthansa Area, and the Asia Games Area. The China World Trade Center Area is where Jianguomenwai (the eastern extension of Beijing’s premier avenue) intersects the East third Ring Road. 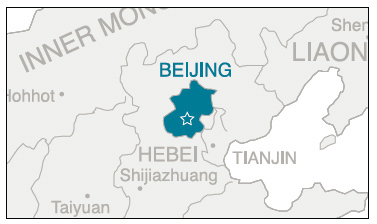 It is one of the most modern and prosperous economic areas in Beijing. The Chaowai and Lufthansa business areas, near many embassies, have many office towers and financial organizations. After the 2008 Olympics, the CBD has experienced significant economic growth due to its growing electronics market, industrial parks, and infrastructure improvements. The CBD will focus on strengthening sales and business services as well as high-end industries. According to the12th Five-Year Plan, an ecological tourism area, a development zone for emerging industries, and an education and service cluster will be established in the area. Chaoyang district has attracted thousands of foreign companies and organizations, with 60 percent of Beijing’s foreign companies and 90 percent of foreign organizations registered in Chaoyang, among them two-thirds of the world’s top 500 companies. The district also hosts the Ministry of Foreign Affairs and three embassy areas composed of some 150 embassies. The Olympic Park in Chaoyang district was the heart of the Beijing 2008 Olympic Games. It is located north of the city and covers 12.15 square kilometers. The Olympic Forest Park is in the north. 14 stadiums, the Olympic Village, the Media Center, the International Radio and TV Center, the National Sports Museum, the China International Exhibition Center and the National Olympic Sports Center, also known as the "Birds Nest" are located in the south. The iconic Water Cube, where Michael Phelps won his eight Olympic gold medals, is also close by. Also known as Yizhuang Development Zone, Beijing Economic-Technological Development Area is located in the northeast of Daxing District. The zone was constructed in 1992 but was not officially recognised as a national economic and technological development zone by the State Council until 1994. The zone covers a total of 46.8km2.and by 2012 there were over 4800 investors from more than 30 different countries and regions investing in the area. These included people from major companies such as Nokia, Mercedes, GE and Bayer. In May 1988, the State Council officially recognised Zhongguancun Science and Technology Park to be a national high-tech production development zone (高新技术产业开发区). Located in Haidian district, the park covers an area of 217 km2. Tsinghua and Peking University as well as 39 other universities and colleges are located in the park. The park is also home to 42 laboratories and 213 scientific research organs.